I was a HUGE Richard Scarry fan when I was little. Richard Scarry was quoted saying, "I'm not interested in creating a book that is read once and then placed on the shelf and forgotten. I am happy when people have worn out my books or that they're held together by Scotch Tape." The copy of Richard Scarry's Animal Nursery Tales at the left was mine from when I was little and it is certainly being held together by Scotch Tape! Reading these books with my kids was a trip down memory lane. The illustrations were so familiar that they almost triggered "LOST"-like flashbacks. Richard Scarry is one of the best selling children's authors of all time. It is hard to determine exactly how many millions of books he has sold. I have seen sources report 100, 200 and 300 million books sold! Regardless of the total, it is enormous amount of books. He has published over 300 titles, which is going to make my library checklist impossible this week, since I only have room for about 10 titles. It is undeniable that most children are attracted to Richard Scarry books. My daughter became excited as soon as I started pulling his books off the shelves. My son has had a case of ants in his pants since the weather has gotten warm outside, but we were able to read four Lowly Worm's How, Where, Why Books , two this morning and two before bed! Richard Scarry also said, "Everything has an educational value if you look for it. But, it's the fun I want to get across." As we read this week we have been able to talk about science topics such as volcanoes, nursery rhymes, occupations, and manners by reading Richard Scarry books. The vocabulary and illustrations open a dialouge about common things we see everyday but do not always have the time to talk about with our kids. But, the books aren't "over the top" educational as they are intertwined with picklemobiles, applecopters, and bugdozers that keep us laughing as we to turn the next page. One last quote from Scarry. "Even on vacation, when I'm in an airport or railroad station, I look around, snap pictures, and find out how people do things." He transformed those observations into detailed drawings, vocabulary, just enough text to allow children to experience our "Busy World" at their own speed. 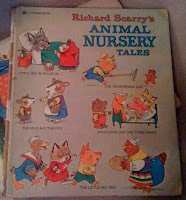 If choose to read few books this week by Richard Scarry with your family, come back and share your childhood memories. Most of us probably have some! My kids love Richard Scarry. He is one of our favorite children's authors. Fun post. Richard Scarry is one of our favorite authors too. The illustrations in his books are great - lots for kids to look at! Great post! I always loved Richard Scarry! I should get my kids exposed to more of his books. Hi, birthdayauthor. You have an award waiting at http://www.darkglassponderings.blogspot.com/. Blessings. This is awesome! Love all the links you posted too. Thanks Eric!